Restoring Your Classic Can Be A Snap If You Have The Right Products. The question of just what is a “restoration” is always coming up. The term usually relates to older cars, but what is a true restoration? Where do you draw the line between restoration, fixing up and modification? Is there a line at all? Does one mean the other? The answers will be different as it depends on whom you ask. Purists (those who insist that the object be returned to its exact, as-original condition) will argue that restoration is only that: restoration. All other activities are just “fixing up.” This definition is too restrictive. For most of us lowriders, we can all agree that car restoration, in general, is nothing more than taking a car apart, repairing/ replacing rusted metal, repairing/replacing mechanical components, etc., and then reassembling the whole thing after applying appropriate finishes. Other hobbyists could consider this is as a resto-modification. This is what a number of lowriders are doing nowadays. It involves a full restoration, but during the process major components are replaced with modern equivalents. A good example would be a classic Chevy Impala that has had the front suspension beefed up. This refers to upgrading to a 605 gearbox or a modern day 350 or 700R transmission, plus air conditioning and other electrical changes. The car will look externally just like an original Impala, and under the hood it will be very similar, but it will drive like a much more modern car. Ask a lowrider what they’re doing to their ride and most likely the answer will be “fixing it up.” Therefore, fixing up is performing any other repairs or replacements in the process of resurrecting an old car, but short of taking it completely apart. There’s nothing wrong with doing this kind of work, it’s just not the same as car restoration. Budget, time and the ability to work on a car will dictate your decision. Whether you’re restoring, fixing up or resto-modifying your lowrider or classic car, we put together a list of products that should help you in your project. 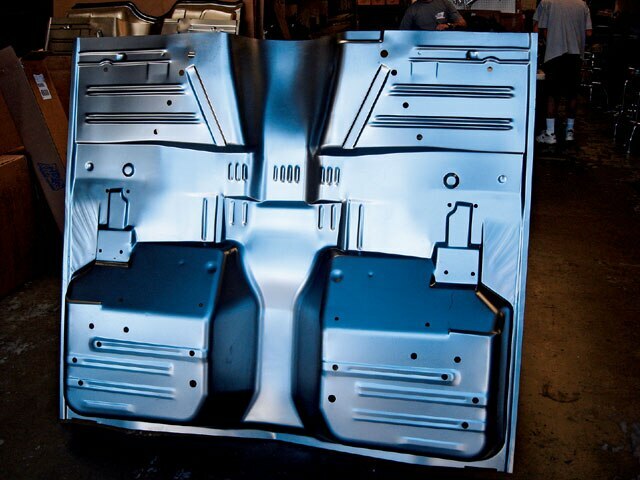 From sheet metal to trim, we have what you need for the restoration or customization of your ride. 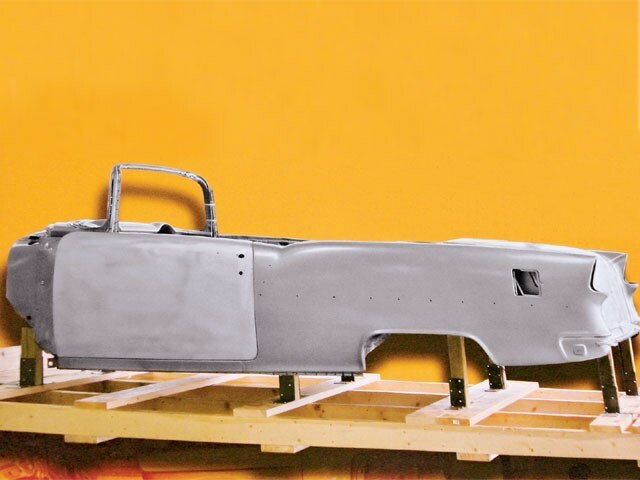 Last year, CARS, Inc. introduced its first ever available 1957 steel body convertible. This year, CARS, Inc. has a new 1955 steel body convertible that can be built it to your needs, from original to a custom lowrider. For more information contact www.carsinc.com. 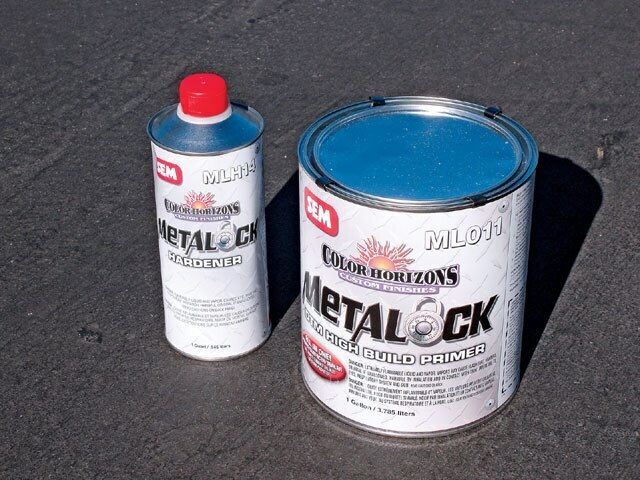 SEM’s Metalock is a true direct-to-metal epoxy primer designed for metal, aluminum, SMC and fiberglass. Metalock utilizes the latest technology to provide superior adhesion, outstanding corrosion protection and exceptional sanding properties to create a solid and dependable foundation for any project. From restoration to custom painting, this primer will get you going in the right direction. Get a basic primer at www.sem.ws. Just Dashes is world famous for restoring vinyl-covered interior parts to concours quality, but what about your hard plastic interior parts? They’re just as important in the restoration process, and Just Dashes can bring them back to like new condition, along with your door panels, dash pad, headrests, armrests, etc. 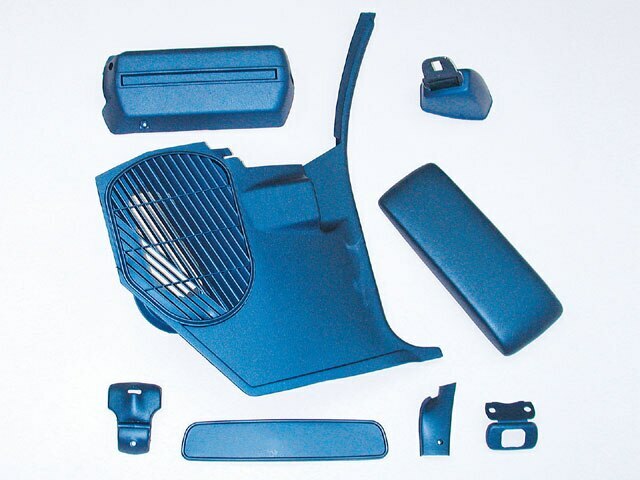 To check out all of their restoration services, like plastic chrome plating, gauge restoration, custom dash pads and more, dash over to www.justdashes.com. Chevy’s ’78-’88 Monte Carlo and El Camino share the same dash pad. This huge pad is literally the entire dashboard of these vehicles, and age, weather conditions and UV rays have usually taken a toll on the vinyl material. Cracks, fading and material lifting are common problems. Since there are no reproductions available, and a quarter-century old original will surely crack as well, a Just Dashes restoration is the best solution. 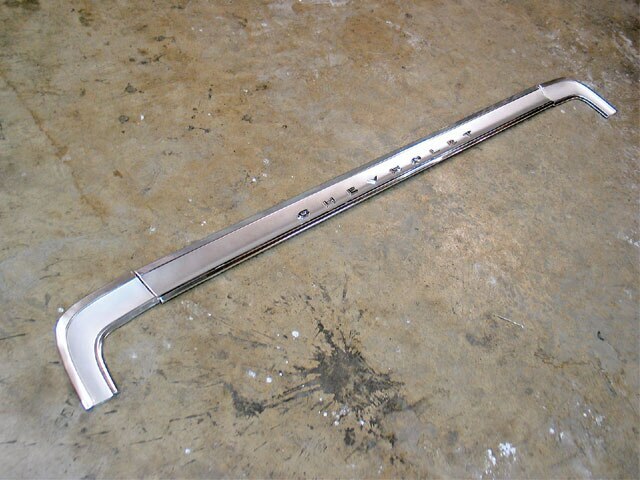 To check out all of their restoration services, like plastic chrome plating, gauge restoration, custom dash pads and more, dash over to www.justdashes.com. Create your own fuel, vacuum, oil and coolant lines or other custom applications with aluminum bulk tubing coils from Classic Tube. Available in 25-foot coils, this aluminum tubing is lightweight and easy to bend and flare. Classic Tube’s aluminum small-diameter tubing is 3003 alloy produced to ASTM B483 specifications. The .035-inch wall tubing is 0-temper (soft annealed) and Eddy current tested to ensure quality and consistency. 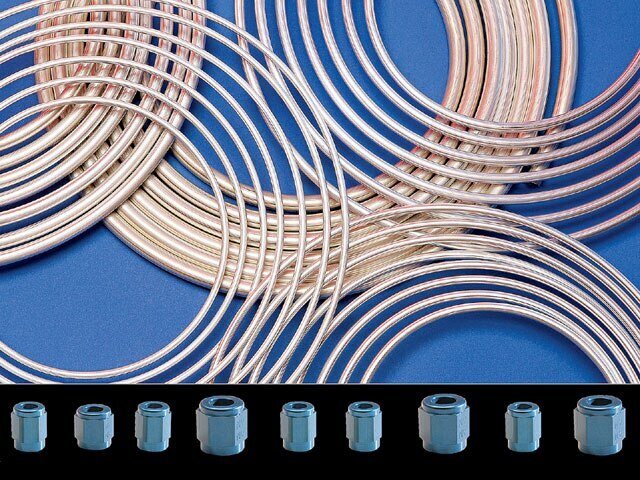 The coils are offered in 11/44-, 51/416-, 31/48-, 11/42- and 51/48-inch outside diameter. Get the full story at www.classictube.com. 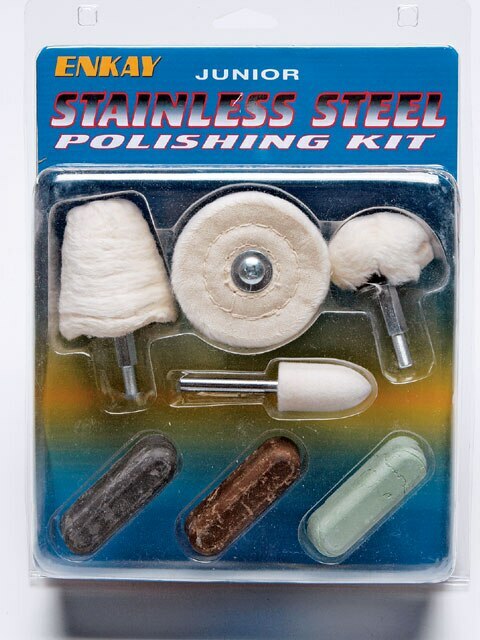 The Junior Aluminum Polishing kit from Enkay Products is perfect for polishing or restoring a mirror finish to small and medium-sized aluminum parts. Each kit has step-by-step photo instructions on the back of a card. For use with any standard electric drill. To learn more about this and other Enkay Polishing products visit www.enkaypolishing.com. 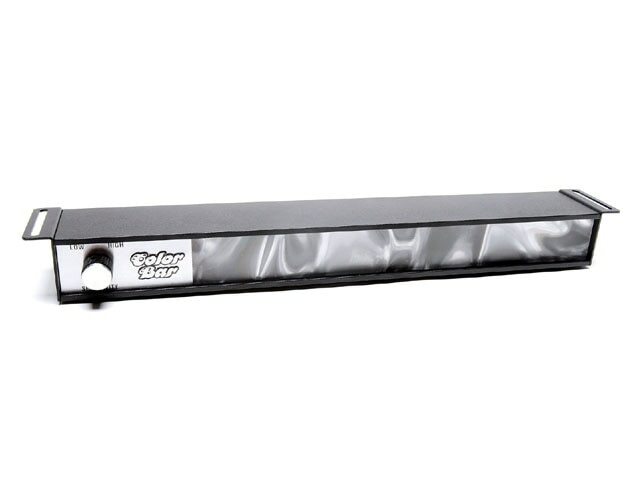 The color bar from MDCT Enterprises is the ultimate cruising accessory. The lights dance to the beat of the music and will help you restore your ride to the style of the ’70s. Available in black and chrome. Groove on over to www.mdctinc.com. 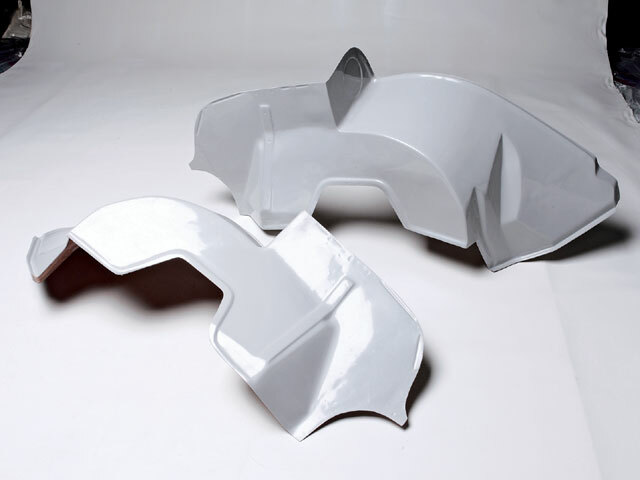 Eckler Industries released its ’57 fiberglass inner fenders that will replace those old rusty metal ones that came from the factory. To learn more about this and other products surf over to www.classicchevy.com. Original Parts Group is now reproducing the complete console-mounted automatic shifter assembly found in ’64-’65 and ’66-’67 Chevelles and El Caminos. These durable, ruggedly built new shifters are virtually identical to the factory originals in fit and finish. 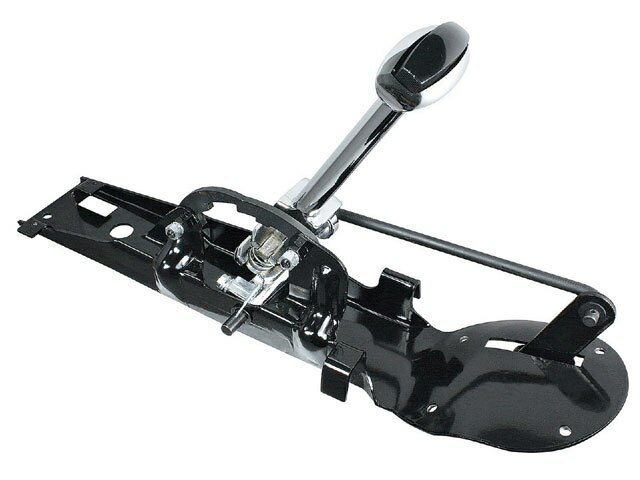 For that “showroom new” shifter restoration, get this accurately reproduced shifter assembly, available exclusively from Original Parts Group. For a free catalog and more information about all of the company’s GM A- and G-body products contact www.opgi.com. 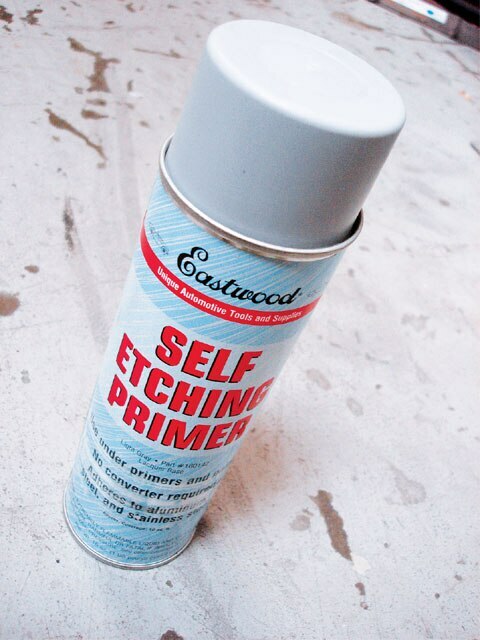 Eastwood self-etch primer is an easy-to-use primer that etches and primes bare, rust-free metal in one step. Adheres to steel, aluminum, stainless steel and galvanized steel, and is compatible with virtually any paint or auto finish. The aerosol self-etching formula bonds better to bare metals than other aerosol primers. It’s also a single-stage formula which requires no catalyst, making it even easier to use. Self-etch primer is also available in black. Cover the basics at www.eastwoodco.com. 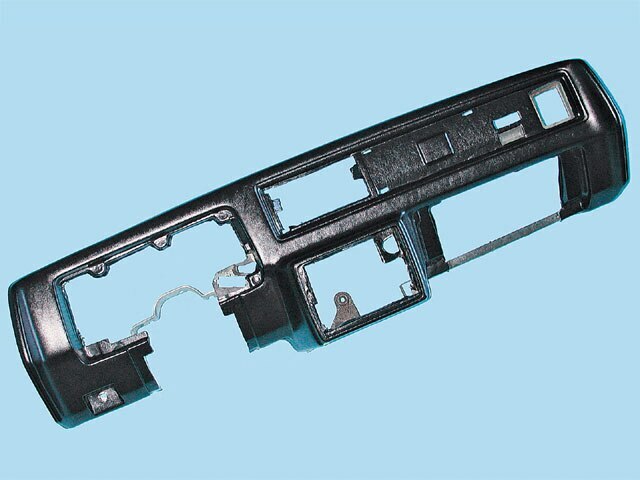 Steele Rubber Products has a variety of replacement weather stripping for your vehicle. From your classic Impala to newer G-body Monte Carlos, Steele Rubber has the exact fit. Seal the deal at www.steelerubber.com. 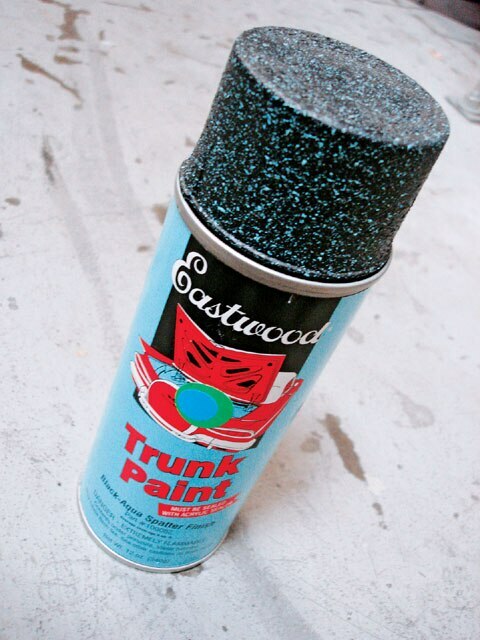 Match original multicolor spatter finishes with this trunk paint from Eastwood. The handy 12-ounce aerosol can eliminates spray gun cleanup. Each can covers about 6 square feet. Cover the basics at www.eastwoodco.com. 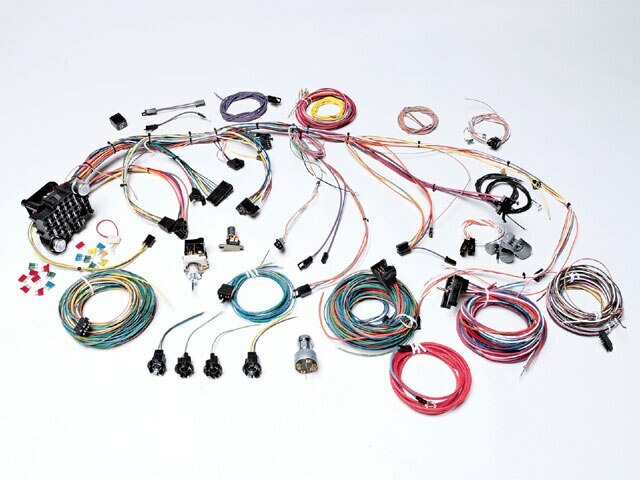 American Autowire-through its OEM restoration division, Factory Fit-has been manufacturing quality wiring harnesses for General Motors vehicles for more than 20 years, specializing in ’47-’82 harnesses. 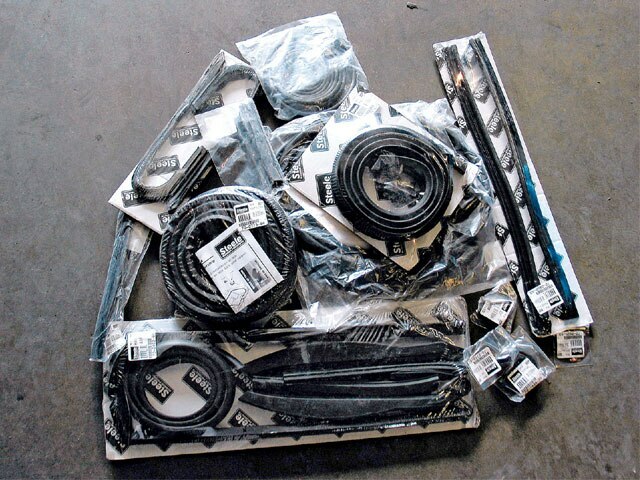 Their Factory Fit line of wiring harnesses is widely known as the symbol of excellence in aftermarket wiring components. To learn more about available applications log onto www.americanautowire.com. CARS, Inc. trim replacement parts for Impalas include the rear cove moldings that will get your car looking as if it just came off of the factory floor. For more information contact www.carsinc.com. CARS, Inc. rear body mounts for ’61-’64 Impalas will help you restore your vehicle back to stock or custom, depending on your needs. These mounts are usually the first to go as water deposits tend to corrode these areas of the vintage rides. For more information contact www.carsinc.com. Soffseal weather stripping is available for several applications, including this ’60 Impala light gasket kit. 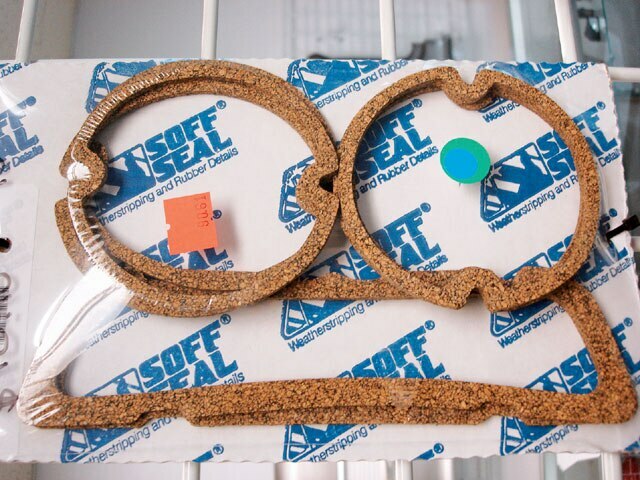 To learn more about this and other weather stripping applications log onto www.soffseal.com. 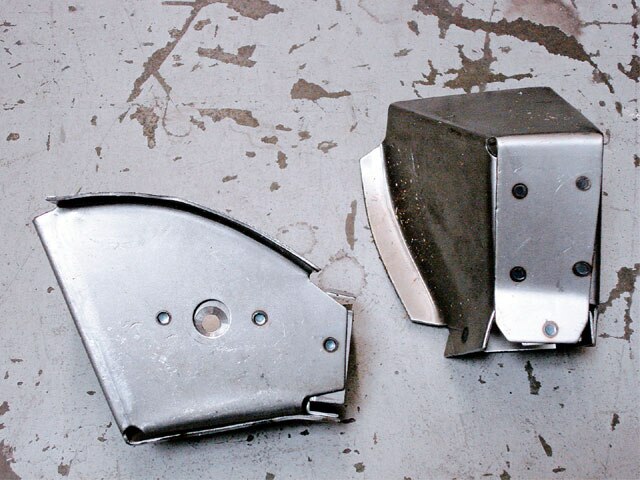 Original Parts Group, the largest supplier of ’64-’77 GM A-body restoration parts, has painstakingly reproduced these formerly hard-to-get fender skirt sets at a price that’s easy on the wallet. Precision-engineered new tooling ensures you of an exact fit. They’re made with all of the factory correct holes, contours, mounting brackets and retainers for a knockout-looking restoration. For a free catalog and more information about all of the company’s GM A- and G-body products contact www.opgi.com. 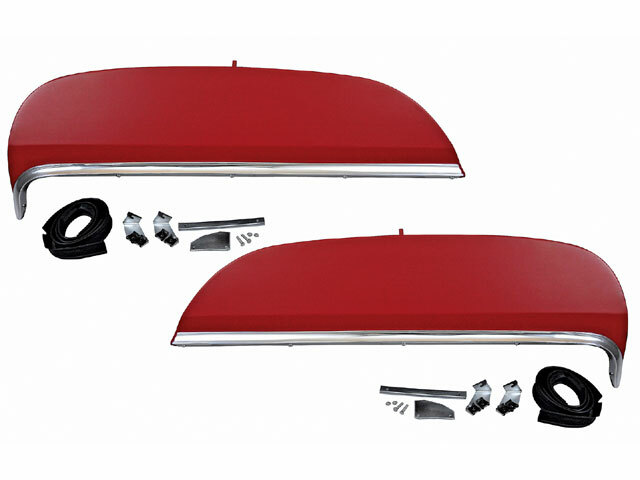 Harmon’s new centerlink fits all ’63-’64 Chevy models including Impala, Bel Air, and Biscayne. 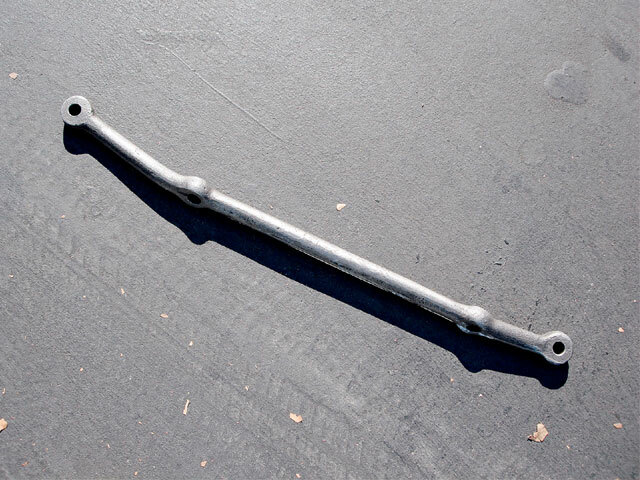 You’ll need this centerlink to restore or just update your power steering. To learn more about this and other Harmon’s products log on www.harmons.com. CARS, Inc. ’59-’60 Impala complete sheet metal replacement floorboards will help you turn your car into a solid ride. For more information contact www.carsinc.com. 3M smooth transition tape is unlike any other tape product on the market and features adhesive down the center of the tape while the edges are adhesive free, allowing the coatings to feather under the edge of the tape. Stick with it at www.3M.com.